Figure 1: Representative standard curves in different assay matrices. 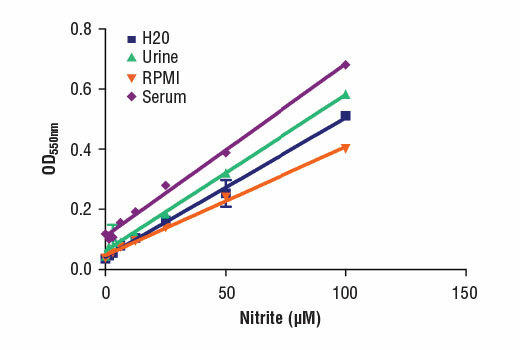 Nitrite standard curves were generated in water, RPMI 10% FBS, serum, or urine. 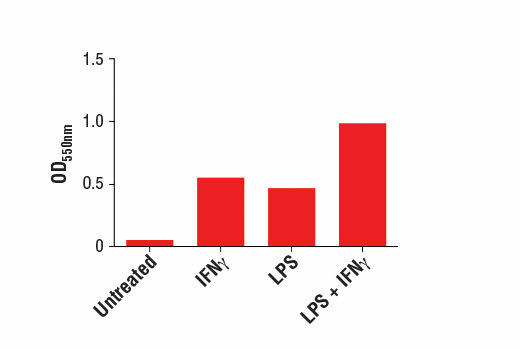 Figure 2: Detection of nitrite in supernatants of RAW 264.7 cells, untreated or treated with Mouse Interferon-γ (mIFN-γ) #5222 (100 ng/ml), Lipopolysaccharides (LPS) #14011 (10 ng/ml), or both. After 48 hours, cell culture supernatants were harvested and assayed for nitrite using the Griess Reagent Nitrite Measurement Kit. The Griess Reagent Nitrite Measurement Kit can be used to indirectly detect nitric oxide (NO) through the measurement one of its stable oxidation products, nitrite. Nitrite reacts with sulfanilamide and N-(1-naphthyl)ethylenediamine dihydrochloride (NED) to yield a pink azo dye. The azo dye produced in this assay can be measured spectrophotometrically using its absorbance at 550 nM. The Griess Reagent Nitrite Measurement Kit detects nitrite levels within a given sample. Detection of micromolar amounts of nitrite is possible using the Griess assay, with the detection range dependent upon the matrix or buffer used in the assay. An estimate of total NO produced requires determination of both nitrite and nitrate levels. As the kit measures only nitrite levels, nitrate should initially be reduced using a nitrate reductase. Nitric Oxide (NO) is a pleiotropic signaling molecule that plays key roles in multiple cells types and tissues. NO is generated by three distinct nitric oxide synthase (NOS) enzymes that catalyze the oxidation of L-arginine into L-citrulline and NO (1). Two of these enzymes, endothelial NOS (eNOS) and neuronal NOS (nNOS), are constitutively expressed in many cell types (1). Inducible NOS (iNOS) is transcriptionally regulated and is expressed in response to inflammatory stimuli, such as pro-inflammatory cytokines (1). NO functions as a potent vasodilator and neurotransmitter (1). In the context of cancer, NO may function as either a tumor suppressor or tumor promoter (2). High levels of NO produced by macrophages are cytotoxic (2). In contrast, research studies have shown that lower levels of NO may contribute to tumorigenesis through promoting angiogenesis (2). Hill, B.G. et al. (2010) J Biol Chem 285, 19699-704. Rahat, M.A. and Hemmerlein, B. (2013) Front Physiol 4, 144.